LONDON // Meeting Sarah Elenany is a striking experience. Not just because she is petite, friendly and brimming with life – although she is. Not because she dresses according to the Islamic rules – in Britain these days that it is unexceptional. What makes her stand out is the way she takes the dress code and turns it into something young, edgy and cool. Of course, the rules are obeyed: she is covered, apart from her hands and face, and nothing is fitted or revealing. But at the same time, she looks more modern than any girl in tight jeans and a cropped T-shirt. 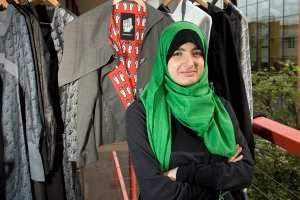 That’s because Elenany is a designer spearheading a bold new fashion: mixing the Islamic dress code with smart, urban streetwear.“I know it’s a big statement, but my brand is the first of its kind. There isn’t anything else like it out there at the moment,” she says. dear Jana. i love ur blog. it's wonderful and i enjoy it. unfortunately in Iran as an Islamic country wee have a little variety in hijab. i read ur blog and introduce it to everybody who wanna wear hijab and be beautiful. She is lovely and i really like her designs. And the quality looks amazing. I just love the dua jacket and when i have some free cash i will definitely invest in that. Salam I'm french and I buy on the site web of Elenany and it's very simple and no expensive. i have the white dress and she 's very beatiful and confortable. I recommand Elenany for all my sisters! !